It’s that run down warehouse thing again! Interestingly in this image the bridged breakfast bar at the end of the island runs right though from the social side of the island into the functional zone allowing it to double up as a preparation area! Stainless steel is an alloy, a combination of metals that become fused together when exposed to high temperature. 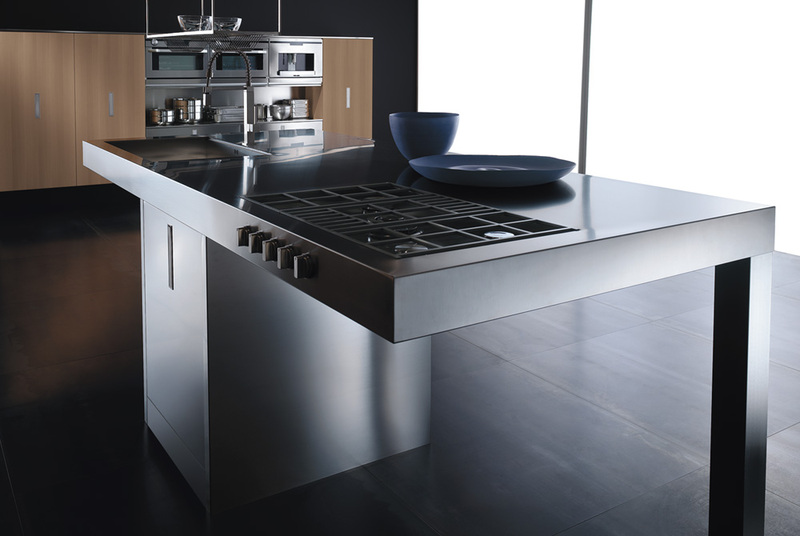 The functional elements of this super hot design are so seamlessly integrated into the work surface and their fusion may well have taken place while the metal was in a liquid state. But just as the T-1000 terminator was made from liquid metal this design shows some similar weaknesses! Is it possible that this shining example if precision engineering has forgotten its functional obligations and that functionality has been compromised in order to achieve artistic perfection? The cooking and cleaning zones are the most dynamic functional elements of any kitchen but here we see that an important storage area has been replaced with fresh air with the user being required to travel away from this island hot zone to gather the non-consumable items needed for cooking. And although not visible in the image is it possible that an exposed sink and waste system could compromise the free floating appearance of this design? A kitchen is a diverse product which is influenced not only by its primary functional obligations but also the complexity of the human spirit. 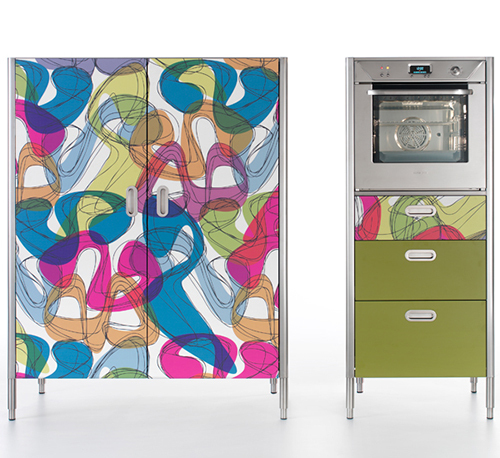 Designs like this one look beyond the norm and allows kitchen design to rub shoulders with art and fashion. Life is about compromise and personal love so why not express these sentiments in the next kitchen you own. 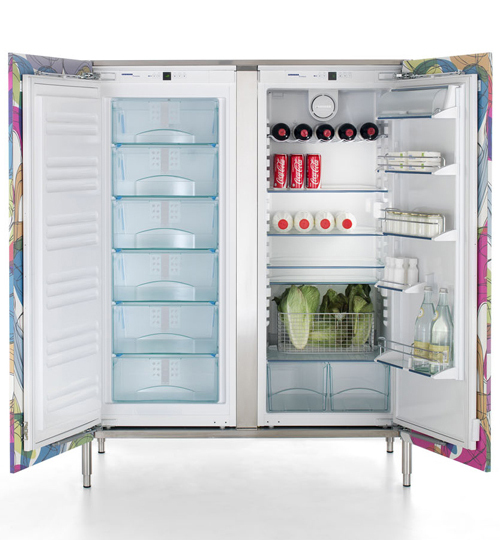 This is the latest flamboyant kitchen contribution from Karim Rashid who literally treats kitchen frontals like an artist’s canvas! In this design paints have been replaced with high pressure laminates and aluminium legs create a supporting frame for the free floating artwork. This type of design may be overpowering if used on an entire kitchen but would work brilliantly as a colour accent to a more simplified and subdued kitchen palette. There is a little bit of everything in this design; seamless architectural integration, soothing holistic elements and an empathetic unity between interior and exterior design. Coloured light is a powerful medium with the ability to sooth the soul, providing warmth to any design. The reflective stainless steel overhang and white surfaces on the island allow the light to move around the room and provide a prelude to the fantastic exterior backdrop. The integration with the garden area is seamless and the breakfast bar acts as a visual runway leading onto an external garden path. The sight lines are connected and so too is the carefully thought out lighting. Every picture should have a frame, an edge that can intensify the visual experience and draw the eye of the viewer. That is why every contemporary kitchen manufacturer worth their salt owns a rundown warehouse! Here though the purchase of an expensive docklands warehouse was not necessary as this design has all the presence needed to stop you in your tracks! Smooth curves, multiple textures and an industrial overtone help to make this design different. However with so much space available in the warehouse, a warehouse with one previous and not so careful owner, it must be asked why the consumables area was not orientated a little differently to prevent the other functional zones becoming a functional obstruction. It is also a shame that the plinth doesn’t follow the contour of the cabinetry! With that said this is still an exceptional design! The kitchen is a functional mannequin which can be tailored and dressed to suit the individual style preferences of each and every client. Although the appreciation of aesthetics may appear shallow to many kitchen design purists it is an element of the design that has far reaching implications. 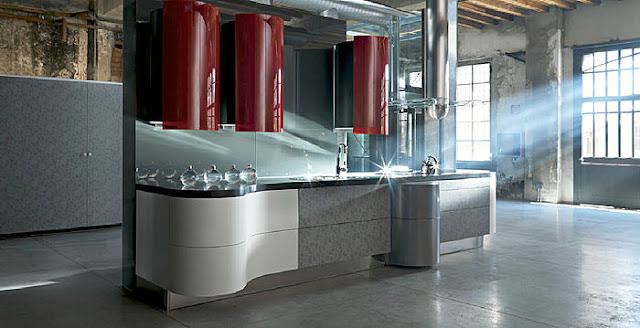 The chosen aesthetics help to define the social and artistic affiliations of the user and whether we like or not the kitchen you own will outwardly proclaim something about you. Functional design perfection will achieve a quiet contentment within the user but so too can individually styled aesthetics, delivering a holistic element to the design which can last as long as the personally tailored functionality. This functional human barometer will quietly display an empathetic understanding of those souls who occupy the space around it, as over time many personal items will become integrated into the original design, making it unique and personal. But why not start as you mean to go on? Everyone wants a designer kitchen; the very description implies that the product has been specially commissioned for the user; so why not get involved in the personalisation of your new kitchen in the early stages. 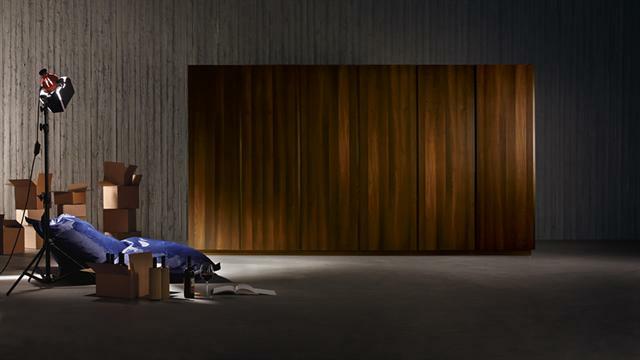 Italian company Effequattro offer a unique glass painted door which allows the ultimate in personal self expressionism. The company have embraced technology and you can actually upload personal images right onto your new kitchen. Check out the link below and have a little fun. It is important to remember though that fashion is a shifting tide and so too are human relationships so if you want to get style longevity out of your design you will need to consider your images carefully! Check out the fridge in images 1 and 4! Looks like a lost extra, excluded from the main stage! For years the kitchen has been planning its escape from the architectural incarceration that has restricted its natural development and resulted in years of solitary confinement. It seems ironic that only when the kitchen is beginning to influence its architectural sentinels and is being placed centre stage within the home, the very designers that set this jailbird free are trying to call time on its short lived parole. 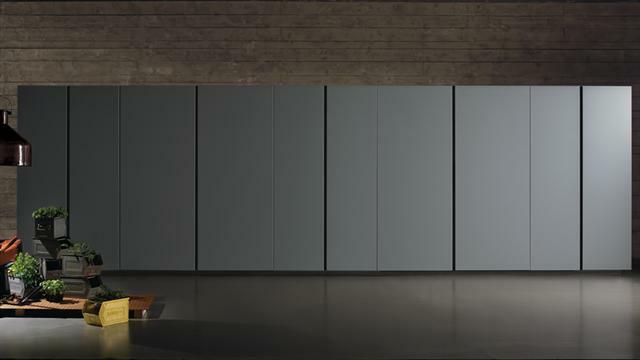 It is interesting to see that this hybrid and on trend kitchen design introduces a transforming boundary between kitchen and the user; a pocket door prison guard that has the ability to send this kitchen down! Is it possible that the best and most progressive transforming and shape shifting concepts are retracting the kitchen from the open plan environment, diluting its influence and throwing away the key for another 25 years!? The boundaries may be different but the restrictions are the same! 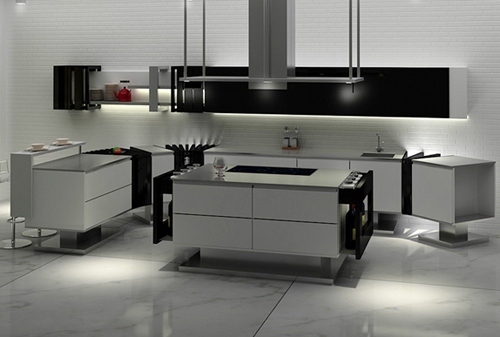 This photographic set up by Tayfun Cetinkaya looks to the future from a slightly retro standpoint, so it is interesting that this feature, which appeared in Marie Claire magazine depicts the perfect modern kitchen as being white, smooth and ever so slightly glossy with a statement island to match the models beauty! 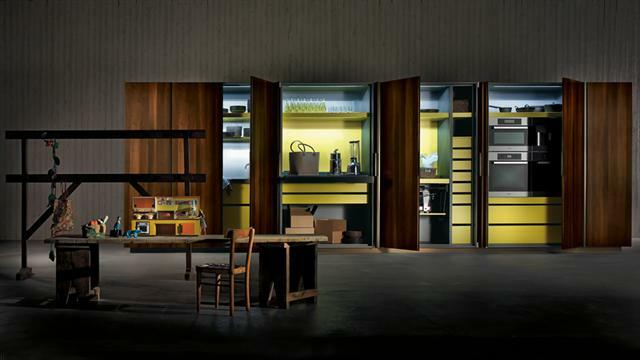 These images prove one very important point though; that kitchen design and fashion design are intrinsically linked together and in this set of images the relationship is mutually complementary! Three cubes, one kitchen and an endless amount of contemporary style! 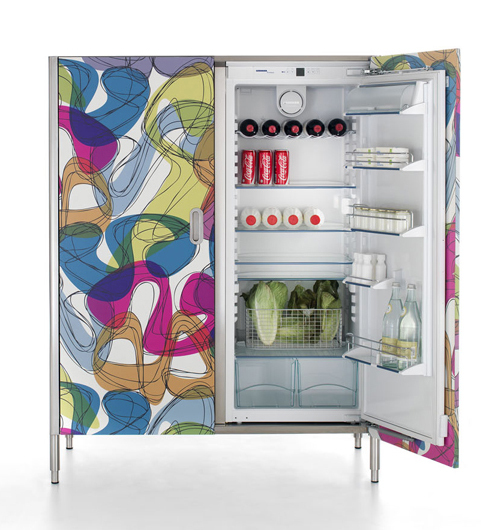 This concept was developed as an adaptable solution for compact apartment living! Made up of three 800mm x 800mm x 1000mm cubes this transforming kitchen puzzle allows the user to create the kitchen that they need, when they need it. Each element can be used independently or they can be combined to create a full kitchen. Each element has wheels which allow the cubes to be moved around with ease. Finished in Macassar, Corian and goldleaf this kitchen has the potential to replace an intoxicated game of Twister when dinner is finished! But would the owner really want to clear up, wash up, stack away the dishes and then pack up the kitchen cubes! In a society that loves convenience The Mogul assumes that an automated version must now be in development!! The neutralisation of the kitchen! Upon hearing that you are going to buy a new kitchen many friends and relatives look forward to seeing the results; but increasingly kitchen designers are becoming involved in an intricate game of cat and mouse. You can only see the kitchen if you can find it first! Transforming kitchens like this one are becoming integrated and absorbed into the structure of buildings and are helping to elevate the influence of the kitchen upon architectural planning. The kitchen is no longer an architectural hangover, it is now an architectural divining rod with the ability to find and harness the inspirational core within every client! 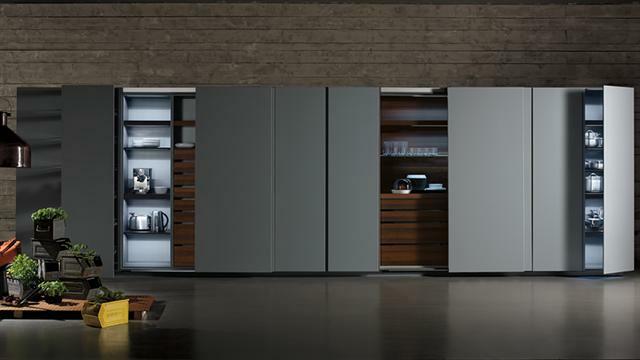 Shape shifting designs allow the kitchen to be controlled by the user, only allowing it to influence the space and the people living within it when required. 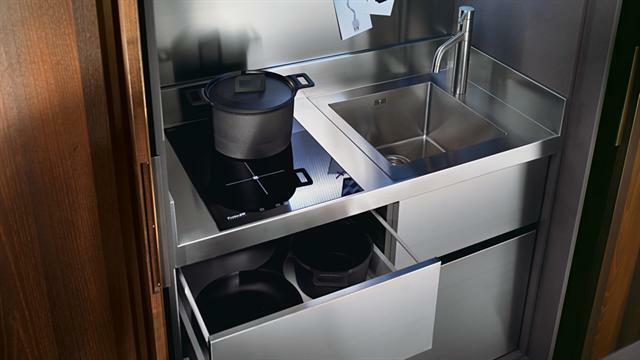 The neutralisation of the kitchens physical presence is an increasingly popular trend and it will continue to grow as populations increase and living environments get smaller! Gone are the days where every wall must have a cabinet, but could this popular practice blunt the artistic edge of kitchen design making it impotent and less expressive!? Six bottle mix of social lubricator! 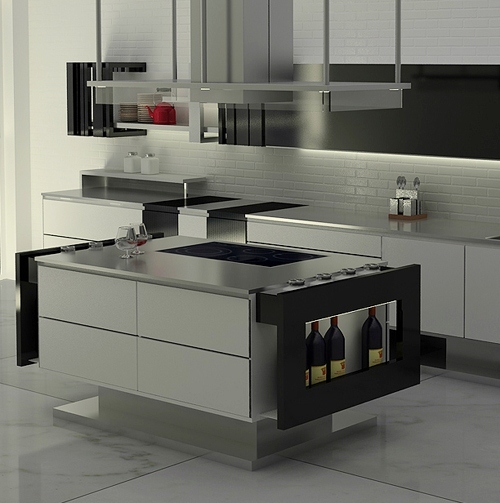 This functional kitchen transformer can bend over backwards to accommodate your needs. 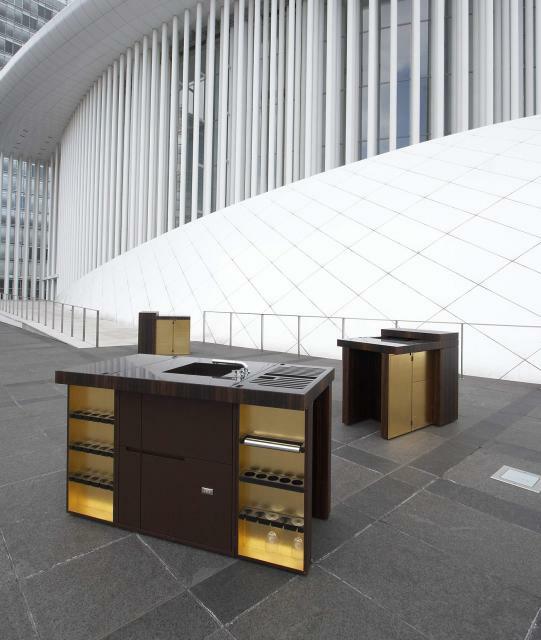 The design has fixed and mobile modular elements that can be moved to envelop the user or retracted to increase the feeling of space! 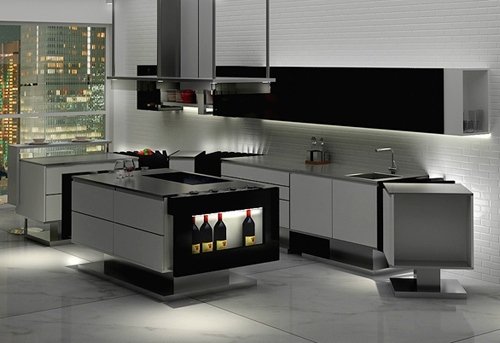 The elements are jointed together by a contemporary spine which can twist the kitchen into different states of use; the effect is amplified by having an illuminated cartilage beneath the futuristic vertebra! 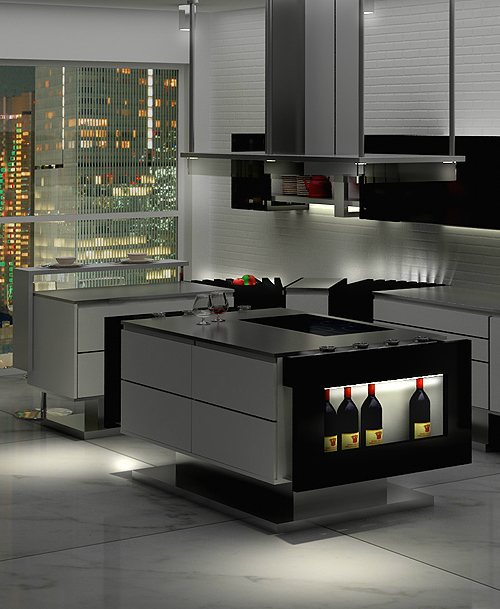 This kitchen is mounted upon a podium plinth which elevates the stature of the design and the island has been given some illuminated holsters, loaded with a six bottle mix of social lubricator!